Sure, we appreciate that this movie is after the fashion of so many we’ve watched on VHS, but the other side of the coin is that it can get very samey, like we’ve seen all this many times before. 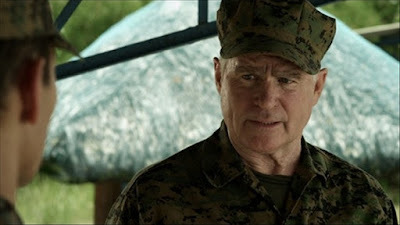 Even the casting of our heroes Treat Williams and Mark Dacascos (as well as Philippine mainstay Henry Strzalkowski) serve to reinforce this fact. This is a movie that wishes it came out around 1994, give or take 5 years or so, and we say good on ya, but it does tend to get a bit run of the mill. Director Brian Clyde also did the very, very similar The Hunt for Eagle One (2006), but in that case Dacascos’s General was Rutger Hauer, not Treat Williams. Naturally, the shooting, beat-ups, and blow-ups are all present and accounted for, with what looks like minimal CGI, to the movie’s eternal credit. A helicopter and a few huts even explode as well, reinforcing the old (ish) school vibe. But this is a movie that very much fits the standard, and is neither good nor bad. It just is. 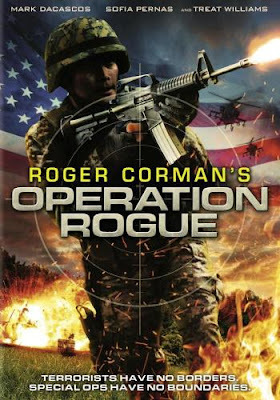 Featuring an amusingly abrupt ending that seems like it was recycled from footage from something else, as if they didn’t have the time, money or inclination to bother with a denoument, Operation Rogue fits in well with others of its ilk. If you like them, you’ll like this. If you don’t, you won’t. It’s as simple as that, which is fitting, as simplicity seems to be the order of the day here. I know this has got an exploding helicopter in, but I recently slogged my way through The Hunt For Eagle One and I'm not sure my wounds have healed enough to attempt a viewing of this. I completely agree with everything you wrote. A solid movie, VERY similar to the Hunt For Eagle One movies. I really dug this one. Got the UK DVD as I didn't feel I should be paying full price for the US disc when it's only a DVD-R! Exploding Helicopter: This one is way better than Hunt For Eagle One. Treat and Mark are solid. Roger: Totally agree. Fun action flick. Happy these type of straight-up 80s-90s type action movies are still being made today. Explosive Action: Cool you bought a copy! It's worth owning for the old-school action factor.